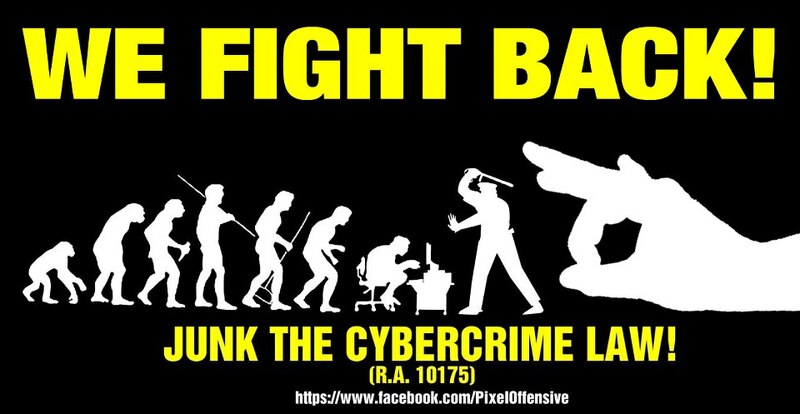 JUNK THE CYBERCRIME PREVENTION ACT NOW! On October 3, the President Benigno Aquino III- backed Cybercrime Prevention Act of 2012 will go into effect in the Philippines. Like SOPA or PIPA, the government will now have the ability to curtail the freedom of expression of netizens based in the Philippines, as well as violate the Filipino people’s constitutional rights guaranteeing freedom of expression. Human rights defenders working in the Philippines, and others who utilize the internet as a political platform, will become increasingly vulnerable to harassment bythe government, unless the law is junked. The Cybercrime Prevention Act of 2012 will also collect real-time traffic data based simply on ‘due cause’ and search warrants will be issued based on ‘reasonable grounds,’ not probable cause. Websites can be blocked, or taken down completely at the whim of the government.